← WHAT IS THAT SONG STUCK IN MY HEAD? 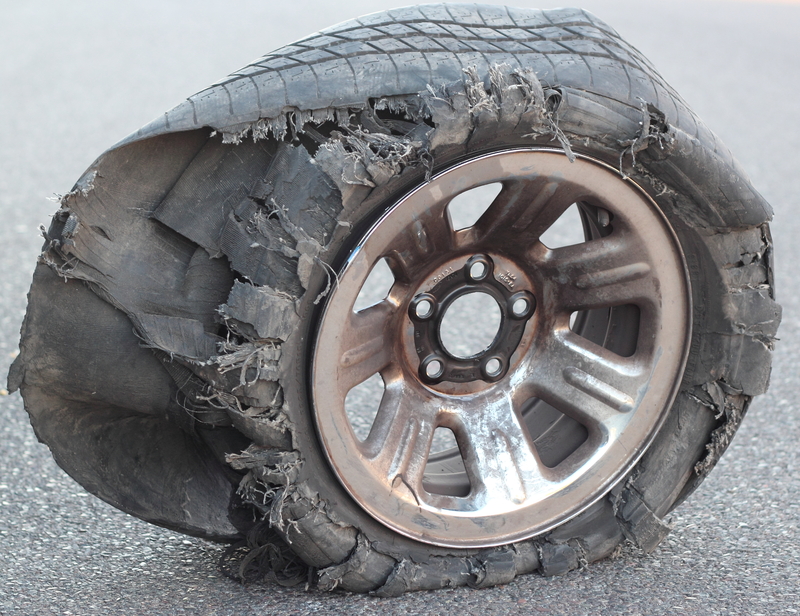 There is never a convenient time for a flat tire. Not even when you come out to the garage and find a tire flat. A flat can turn one’s life instantaneously into an adventure. I remember the first flat I ever had to change. It was the summer of ’68. My dad let me borrow his truck, a 1951 GMC pickup nicknamed “The Rainbow Bomb” because it had a grey body, white fenders, red doors, a blue sun visor and an orange tailgate. Me and a buddy were heading to the Saturday night dance at the National Guard Armory up in Prescott at about 10:00 pm when one of the tires goes flat. So I pulled off the main drag and began to change the tire. Now to get to the jack and the lug wrench, the bench seat of the truck needed to be pulled out of it. I put the bench out on the grass. There were no streetlights on that corner, but I did have a flashlight to work by. In the meantime, my parents happened to be going home from the movies, drove by the truck, saw the seat on the ground. Because of the distance and the darkness, and the fact I was hidden from their sight by the truck, they thought that the seat on the ground was a body, specifically my body. Of course upon seeing me they realized that I was very much still alive and all was well, and after my parents’ panic subsided, we all had a laugh over the situation. But that was not the last experience I had of jacking up a truck and removing a tire during that summer. I was working at the Eagle Drug Store, and one Saturday night after it was closed, the owner, me and a couple of other employees stayed around to do some much needed remodeling. About midnight, I drew the short straw and had to take a pickup load of trash out to the county dump. So I drive out to the dump, which is out in the middle of nowhere, just me and a load of trash and my boss’s pickup. Got a flashlight and checked underneath the truck. Wrapped around the right front wheel and the front axle was barbed wire. How in the world was I going to get that barbed wire off the axle? (especially before the zombie apocalypse) I tried unwinding it off the axle but was having no luck in getting the wire off. It finally dawned on me that if I took off the tire, I could slide the wire off of the axle. Needless to say, that worked. I finally got back to the drugstore at about 2:00. I don’t think the owner bought the story that barbed wire wrapped around the axle of his truck and that is why I was gone for 2 hours. Plus, I go home and my parents are mad because they don’t think I have been at work until two in the morning. It’s like nobody cared that I was able to get the truck working by sheer genius and ingenuity and that I totally avoided any contact with whatever junkyard zombies might have been lurking out in the dark. Pretty much the way it is when one is 17. Present day. The latest Timmy adventure with a flat tire. I had gone out to Mesa last night to attend a PAC meetup on the business of photography. It took me forever to get there because of 2 traffic accidents. I was on the exit and overpass from the 101 to US 60 for about 20 minutes, it was that backed up. When I finally saw the crash warning sign it told me that the 2 left lanes and 1 right lane were blocked. That meant the freeway funneled into 1 lane. Yikes! Other than the drive, the meetup was great. Headed home at about 9:30. Getting close to my exit, I pulled over to the right hand lane. All of a sudden I hear the noise and feel the thumping. My first thought is I should try to get off the freeway, but having had flats occur on the freeway at 65 miles an hour before, I knew this one felt really bad. Using all the tricks of driving I had learned from watching endless hours of the Rockford Files, I kept the truck under control and pulled off of the freeway and on to the shoulder. Fortunately there was additional room so I could pull entirely off of the paved shoulder and onto crushed gravel. And unlike ’68, cellphones have been invented. I called home, and then called AAA for a tow. I just wasn’t in the mood to be changing a tire in the dark on the side of the freeway at 10:00 at night. Because I was on the freeway, AAA viewed my situation as a matter of safety and put me on the rotation for the first available driver. They also gave me the number for the Highway Patrol, just in case. I took advantage of AAA text message service in which they text you the ETA of the truck. While waiting, a Highway Patrolman pulled up behind me and came over to check out the situation. 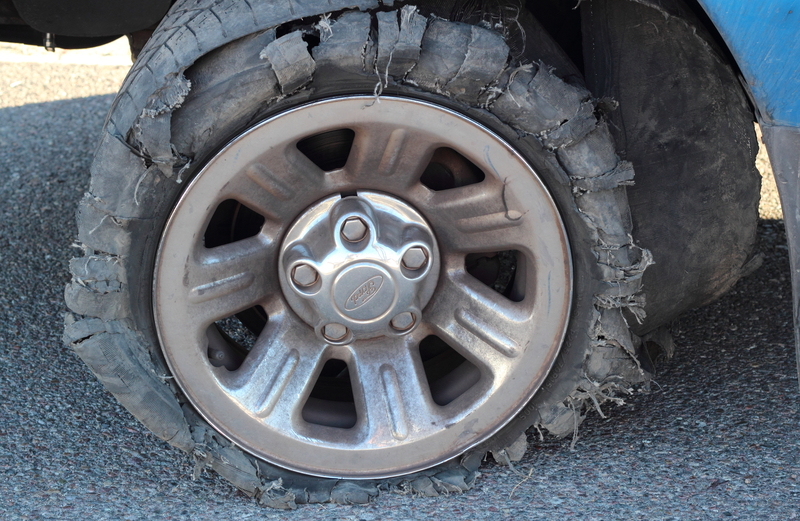 We both concluded that as bad as the tire was, there had been a possibility that the situation could have been much worse. He was willing to stick around until the tow truck came, but it was 10 minutes out so I said I would be alright and he went on his way. Right after he left, the tow truck pulled in. Tim, the driver, said he could change the tire or tow me home. I said tow me home. Although this was a pain and time consuming, I always try to reflect on the situation and examine how much worse things could have been. The tire could have blown out on the ramp from 10 to 17. I could have been in the far left lane when it blew. It could have been possible for me to lose control and careen into another car. As much as I didn’t want a flat tire, it happened at a perfect place on the freeway, a place I could get off the road easily and quickly and pull over far enough to not be in danger from the freeway traffic. Got to be thinking the guardian angel was working a bit of overtime last night. I also want to give a shout out to Triple A, their driver, and the patrol officer. I know they were just doing their jobs, but they were polite and helpful and did their jobs well. Thanks, guys. Holy-moley! I think that tire is actually a zombie you ran over, who ate your tire!! Hahaha. You might be right. I was wondering if anyone from Prescott would read this. You can attest that the dump is way out there and dark and scary at night. Maybe not as scary as Angelina’s grave, but still spooky enough.